The NLP Communication Model, developed by Tad James & Wyatt Woodsmall (1988) from the work of Richard Bandler & John Grinder (1975), is one of the key structures in Neuro-Linguistic Programming (NLP) – though it draws heavily on concepts in Cognitive Psychology and the ground-breaking work of linguistic analysts Alfred Korzybski (1933) and Noam Chomsky (1964). The starting point for the Communication Model – perhaps for NLP itself! – is Korzybski’s statement: The Map is not the Territory – which was adopted by Bandler & Grinder to become one of the founding presuppositions of NLP. In other words, we form cognitive representations (maps) of reality (the territory) – but the representation is not actually the reality, just as a map of a place is not actually the place itself but a representation more or less accurate. The concept of cognitive maps had been developed by the likes of Edward C Tolman (1932) and Kenneth Craik (1943); but Korzybski was arguably the first to draw attention to the degree of accuracy (or not!) of our mental maps. According to Korzybski, we delete, distort and/or generalise incoming information (memes) which then affects the way we attribute about both ourselves and others. Distorted thinking can include polarisation (thinking of things in absolute extremes – eg: wholly bad – Sally is evil – or wholly good – what a nice man Bill is) and personalisation (it’s all about you – eg: David’s glaring because he hates me). An example of generalisation would be: exams are really hard. What evidence do you have that Sally is evil? What things has Sally done that weren’t evil? How do you know Bill is a nice man? Has he ever done anything that was less than nice? Which exams do you find harder than others? The basic version of the Communication Model (above) shows that we distort and/or generalise incoming information because it gets filtered via our values, beliefs and memories. Abraham Luchins (1957) called this effect cognitive primacy. Non-consciously we don’t actually accept things as they are but we change them to fit with what’s already inside our heads. The great developmental psychologist Jean Piaget (1927) saw this as the process of assimilation of new information into our existing schemas. If the new information can’t be easily assimilated, then the process of accommodation may take place. This can cause real dissonance. Existing schemas may need to be modified or even deleted and new schemas may be created. Of course, new information that really doesn’t fit may simply be deleted! Nor is this filtering a passive thing. We actively scan for evidence to confirm our existing worldviews – ie: confirmation bias. The behaviour we display in response to the information we filter in again will be dependent on the values, beliefs and memories we hold. The standard version of the Communication Model (below) presents us with a much fuller picture of how we create our internal representations (cognitive maps). Firstly, it significantly increases our understanding of the deletion process. Most of this is lost instantly – effectively deleted – unless we pay it attention. As Fritz Perls, Ralph Hefferline & Paul Goodman (1951) put it, we are hard-wired to notice difference, – see The Process of Change. Thus, we are much more likely to pay attention to something if it is different in some way – interesting, threatening, fun, etc. 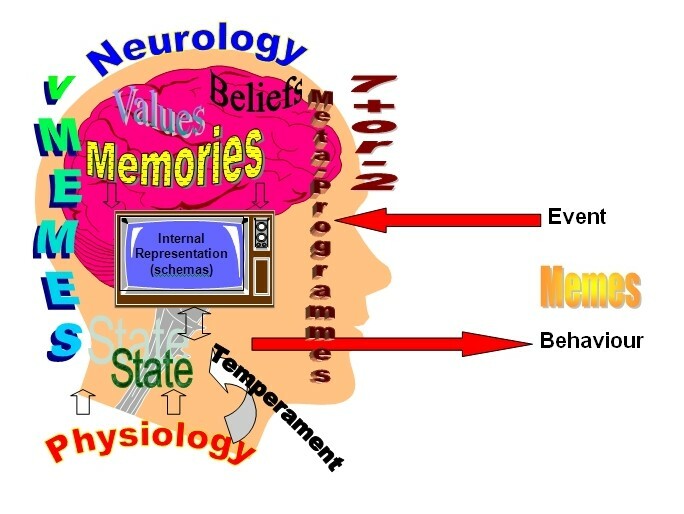 Thus, what we pay attention to enters our short-term memory (or working memory or consciousness or conscious mind). 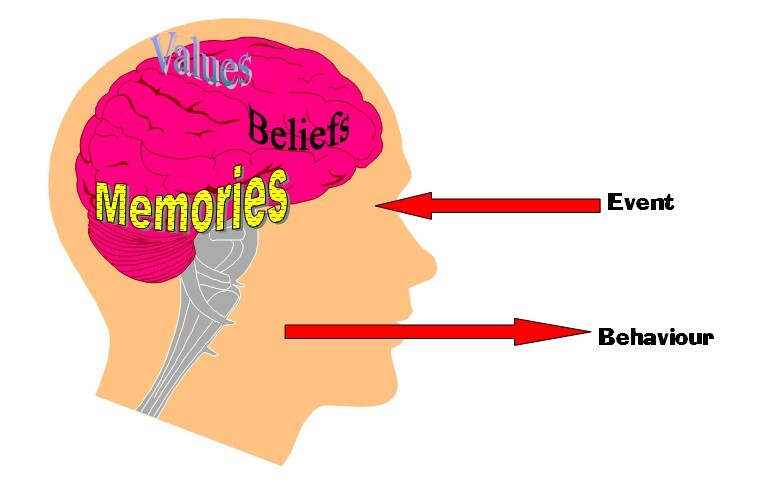 However, as Joseph Jacobs (1887), demonstrated, the average person’s short-term memory can only hold 7+/-2 simple concepts at any one time. George Miller (1956) showed that the capacity within those parameters could be increased through meaningful chunking. However, chunked or simple, the concepts can be displaced from short-term memory at any time by the arrival of fresh information and will fade away rapidly if not consciously rehearsed or thought about. 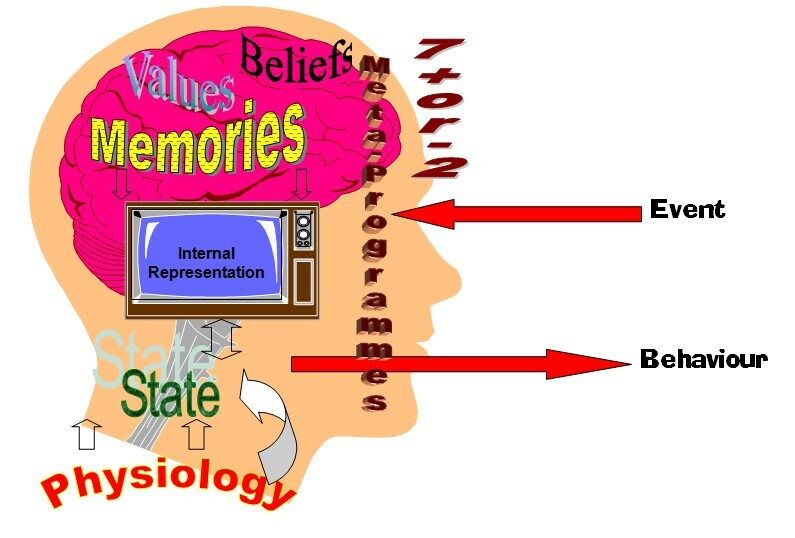 Transference into long-term memory is primarily through the attachment of meaning to the item. Thus, only a limited amount of material can make it into our consciousness and is unlikely to be sustained there unless of major importance to us. 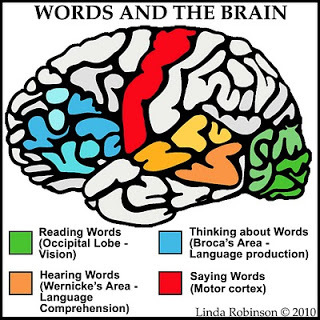 It’s very much worth noting here that a great many people struggle to listen to fresh incoming information (via Wernicke’s Area in the temporal lobe of the cerebral cortex – see graphic left) if they are rehearsing what to say in response (via Broca’s Area in the frontal lobe). As part of a series of experiments relating to their Working Memory Model, Graham Hitch & Alan Baddeley (1976) demonstrated how difficult it is to use what they termed the Articulatory Process (speech production) at the same time as the Articulatory Store (noise and speech decoding). In essence, people are too busy planning what to say to listen to what’s being said. No wonder people, cooling down after a heated argument, often found that they misunderstood what the other was saying! 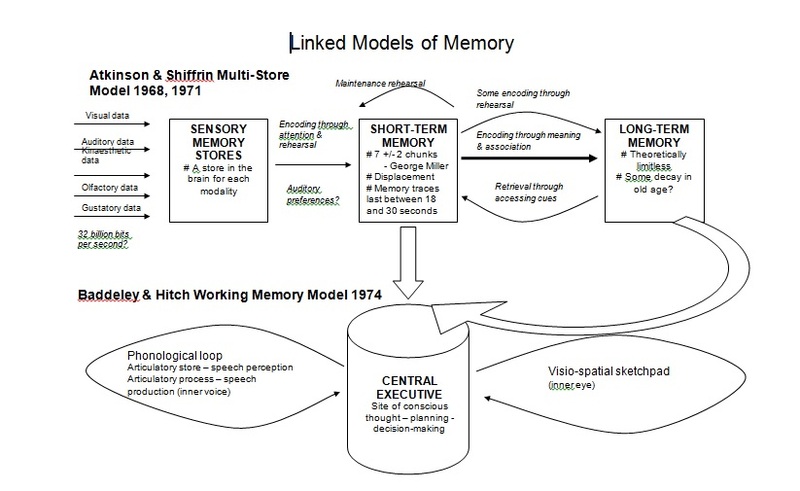 The graphic below depicts the Working Memory Model as a detailed exploration of how we hold and process information in the Multi-Store Model concept of short-term memory. The standard Communication Model also shows the effects of meta-programmes in processing information in and behaviour out. It shows how the cumulative effect of all this filtering upon our internal representation affects our overall state – though this can also be affected considerably by our physiology. For example, the emotional state of approximately 75% of all women of child-bearing age is influenced by Pre-Menstrual Syndrome – while just about everyone finds it more difficult to be positive if they’re suffering from a bout of the plain old common cold! Understanding how our physiology affects our state and, thus, our responsiveness in communication enables us to make allowances and change strategies when appropriate. Simply getting someone to alter their posture can improve their state and so their willingness to engage in what you have to say. What I call the enhanced or NLP+ Communication Model (below) adds to the standard version vMEMES, Dimensions of Temperament and memes. As we know from the Assimilation-Contrast Effect, vMEMES powerfully influence just how we distort incoming information – and, of course, they shape our values and, thus,the whole filtering process. The meaning we make from the incoming information and how we process that meaning – meta-states – is shaped by vMEMES and the Cognitive Triad at every stage of meaning-making. Naturally, since vMEMES are our motivational drivers, they very much determine our behaviour. The study of Memetics – schemas outside of our brains – has facilitated greater understanding of how ideas can spread in a virus-like fashion. Now we understand that all communication is effectively in memes. To spread, memes need to turn into internal schemas. To do that, they have to get through the filtering processes which are driven by vMEMES. Once in, of course, new ideas can cause all kinds of effects – including bringing about vMEMETIC change. One of the factors affecting change will be temperament – especially if temperament is locked up with vMEMETIC structure and a centre of gravity is formed. See Integrated SocioPsychology. All of this, of course, assumes a healthy neurology! And so this understanding of the many factors which affect human communication enables us to have more control of our communications. What we take in and accept – and how we do it, with strategies to give us more opportunity for making sure we’ve got things right. It enables us to take a more circumspect view of others and the factors which may be influencing how they are behaving. In other words, we have more ability to understand ourselves more and to understand others more. And that gives us greater responsibility to make more effective communication…. Thank you Keith was just looking at this – great simple model explanation.